I promised I’ll offer here, on this blog, tips from my experience, but that I’ll also present case studies that can teach us all something. As well all know, traffic is very important. And, as there are a myriad of websites and blogs, one might think that it is very hard to launch a blog and gain relevant traffic in a short period of time. But it is not. Today I invited a travel blogger from Singapore to share with us his success story and tips. 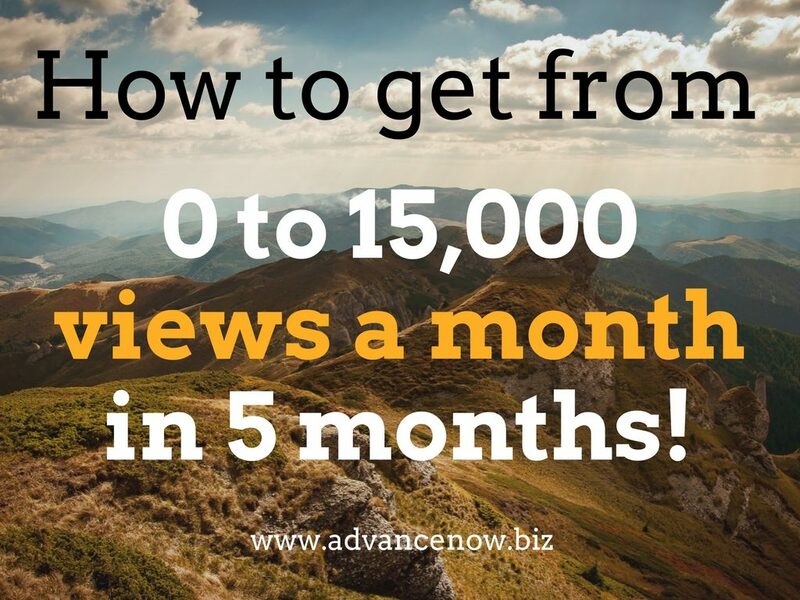 I met Bernard online, in a Facebook travel group, and, as he managed to get from 0 to 15,000 views a month in 5 months, (he’ll have more than 20,000 views in the sixth month!) for his Bernard the Traveller blog, I invited him to tell us exactly how he got here. My name is Bernard Tan, I am based in Singapore and am a business consultant. The travel bug bit me about 3 years ago, and it has always been my dream to start a travel blog to share my love for travelling and exploring the world. Procrastination, excuses and work have taken a toll of me and it was until Feb 2016, where I started my travel blog. The first blog post was about my review on the Expedia best price guarantee, as I was preparing my overland trip from Bangkok to Cambodia followed by Vietnam for June-July 2016. 2. What made you want to launch a travel blog and how did you find a niche? How often do you write new articles on the blog? My blog is about travelling in Asia by Asian, I have always find it fascinating to travel in Asia, the culture, the beauty and the people. 3. Did you make a plan to grow your blog since the launch (or even before that)? What did it include? I did not have any plan at the initial start, it was just about writing and leaving it to God. When I first started it was all about promoting to my friends through my personal Facebook. 4. How did you promote your blog? 5. How do you promote a blog post? 1. Facebook groups – there is no exact plan, sometimes I post it early in the morning, sometimes in the afternoon, sometimes late at night. The key thing is to have good content, other users would like your Facebook post and it would stay on top. 2. I also try to answer questions to help users from backpacking groups. I have never learned photoshop and am not good at designing but canva.com give me good ideas in creating pins. I realized that for pinterest the most important is to have captivating photos to attract people with supporting words to let them know what is it. But for facebook boost page is more about having a mysterious or captivating topic so that others would be curious to click into it. 6. How did the traffic evolved? How much time did you invest in the blog? And How much money so far? (1) Sometimes we are super blinded by the design, I always used peek.usertesting.com to test my blog page and to get genuine feedback, and to be honest, I have heard some users that didn’t like my blog and to test out certain buttons, and I have made necessary changes to make it more user-friendly. Don’t be discourage, a blog is never build one day, it is a constant improvement. 7. Any tips for other (travel) bloggers (who have a blog, but not so many visits so far) or for those who want to launch a blog? I am currently focusing on 2 social media at the moment, and it brings in good referrer. Stumbleupon is sometimes a hit and miss, I have a few post that has been a hit with Stumbleupon. It is like buying a lottery, if you win you get loads of views. 8. How do you see your blog evolve? Do you have any specific goals now? I would want to see my blog grow to 100k views per month in 6 months time. I believe that in August I would be looking at 20k views. I have not set a monetary goal, as if you see my blog, this is not the focus, but I am looking at how to grow the monetary to sustain the blog and make a livelihood. I have been approached by some companies to write reviews for them, and have been invited to review hotels and tours. 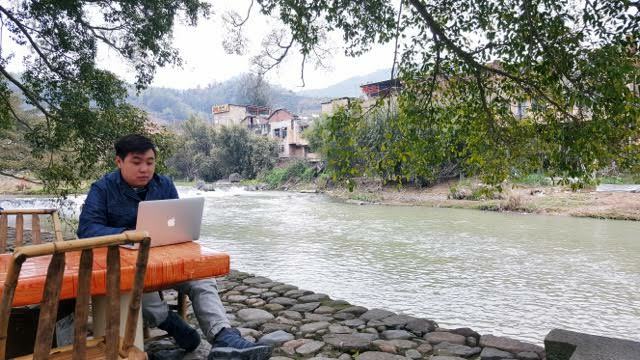 The blog started as passion, but I do hope that the blog would be able to sustain my lifestyle and my travels. 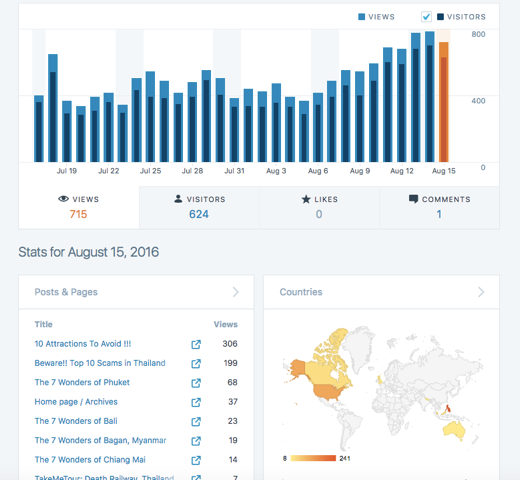 At the end of August, Bernard had more than 22,000 views!